Blues stands out for its functionality and versatile style, since it can blend in with even the most singular settings. 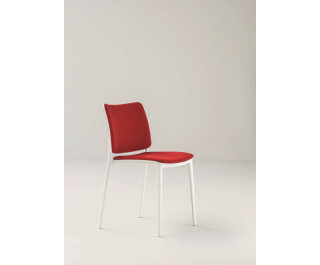 In the Blues XO version, the chair is entirely upholstered; in Blues XOXO, only the seat and backrest are upholstered, while the polypropylene frame remains visible. The upholstery is available with fabric, leather or eco-leather covers. Blues is perfect for any space, whether private, from the kitchen to the living room, and even the home office, as well as public, with the most diverse applications in the contract industry.